Arnold Schwarzenegger has been talking about creating his own line of watches for some time, but has yet to deliver. In the mean time, Schwarzenegger wears the Panerai Luminor most frequently. Arnold Schwarzenegger is an Austrian born actor, writer, body builder, and politician. He is most famous for his roles in the Terminator series, in which he played the titular Terminator, a machine sent back in time to kill the leader of a human uprising. Arnold is known around the world for achieving his goal of being the greatest body builder in history. While this may seem to be a subjective title, Arnold definitely has some achievements here to his credit: He still holds the record for being the youngest person to ever win the Mr. Olympia title – first achieving the title in 1970 at the age of 23. He won Mr. Olympia another 5 times in a row after that, and then again in 1980 when his entry was a last minute surprise with only two months of training for the event. Added to his already impressive resume, Schwarzenegger ran for – and won – the governor’s race in California, officially making him an accomplished politician. He was the chief executive of the state of California for 8 years. Arnold is a watch fanatic and avid watch collector. His favorite seems to be his Panerai Luminor, which is frequently photographed wearing. 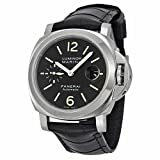 The Panerai Luminor features a stainless steel case with a black croco-embossed genuine leather strap. The watch itself is 44 millimeters in diameter and 15.5 millimeters thick. The case back is stainless steel and features the engraved Panerai logo to certify authenticity. The face of the watch is marked with Arabic numerals. The dial is black which helps the luminescent hands and hour ticks to stand out during low light use. The Luminor features two complications: The date at the 3 o’clock position, and a second counting sub-dial at the 9 o’clock position. The crystal is sapphire with a specialized coating to cut down on glare. Being sapphire, the face is also scratch resistant. A unique feature of Panerai watches, the crown itself is protected by a unique lever. This makes the watch easy to identify and adds a certain elegance to it. The watch runs on an automatic C.O.S.C. 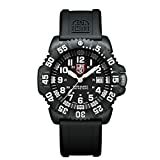 tested engine developed by Panerai and is water resistant to 30 BAR, or 300 Meters / 1,000 Feet. The Luminor is suitable for swimming, snorkeling, and amateur diving. Coming in at a price of $5,197.01, this watch is not for everyone. But it is worth every penny for those that do buy it. What watch did Ernest Hemingway wear? Ernest Hemingway wore a Rolex Oyster Perpetual. When it comes to Ernest Hemingway, the average person will only see him as the writer of, “The Old Man and The Sea”. However, he was an incredibly complex person that traveled all around the world, went to parties, was an amateur boxer, and an alcohol connoisseur. As is true with many artists and honest story tellers, Hemingway was a bit of a tortured soul. So many of his writings are incredibly interesting because they tell the stories that reflect the complicated and difficult nature of being human. He was a heavy drinker and lived a life of chaos much of the time. As he is also known for tragically ending his own life, it is easy to see that there were not many stable things in his life. There were two things that were very consistent for Ernest Hemingway. The first was waking up and writing. He was known to write every morning as soon as he could. The other thing that was incredibly steady was his Rolex Oyster Perpetual. This was the watch that he wore almost every day. It was a classy steel watch that was the steady timekeeper for the man with a life that was all over the place. The Rolex Oyster Perpetual is a beautiful steel watch (or “Oystersteel”) with a stainless-steel band. However, Hemingway’s Rolex Oyster that he was often pictured with is from the 1950s and is 18 carat gold and has a leather band. Here Hemingway is equating the accuracy of an Oyster Perpetual to the human heart. But in the case of a Rolex, it can be fixed if it needs to be repaired. This was not a product placement, Hemingway had a genuine fondness for Rolexes and wasn’t afraid to show it. The Rolex Oyster Perpetual is one of the iconic watches of the 20th century. The “Oyster” refers to the proud water resistance heritage – indeed it was the first waterproof watch to be produced. Rolex heavily marketed its waterproofing qualities after the first woman to successfully cross the English Channel, Mercedes Gleitze, wore an Oyster during her achievement. This proved to be a great endorsement and Rolex still uses this in their marketing material. The Oyster Perpetual is Rolex’s entry level model. Its classic design doesn’t come with features such as date or day and comes exclusively in stainless steel. This is a great watch if you’re thinking of entering into the world of Rolex. Ernest Hemingway has also been spotted wearing a Rolex Bubbleback. The Bubbleback was the pre-cursor to the Oyster Perpetual, and was one of the first automatic watches available when it launched in 1933. Getting its name from its distinctive protruding “bubbleback” case, Rolex decided to house the large auto-rotor movement in a larger case rather than increase the watch’s overall size. Hemingway’s Bubbleback probably dates from the late 1940’s. While he was most commonly seen wearing his Rolexes, he also had several interesting pocket watches. This seems even more incredibly fitting for Hemingway, the cigar smoking, rum sipping, bull fighter. Nothing says, “intellectual writer”, like the Hamilton pocket watch that he was given by Ava Gardner for his 55th birthday. Obviously, there is no need to constantly check the time if you are in the depths of writing for the first half of the day and chasing experiences in the evening. That is why a classy old pocket watch would be perfect. There are so many different things about Hemingway that you could dissect and try to understand. The complications are what made his work great, but also lead to his unfortunate end and his misery. One thing that he could count on was his steady Rolex Oyster Perpetual, but even that could not calm the tides for this old man and his internal sea.